I knew this day would come. I never realized just how hard it would be. Over the weekend, during a normal coop cleaning, I noticed one of our hens, Zorro, acting a bit odd. Her sluggish body and inability to stand were signs something wasn’t right. I closed up the coop that night, hoping for the best. Each day, Zorro got progressively worse, never leaving the coop. Tossing and turning in the hay, trying to get comfy. The other hens were quite irritated with her, since her presence meant they couldn’t lay their eggs in absolute solitude. Chickens. Who knew little birds could have such personality and be so opinionated. Zorro, still as sweet as could be, refused to leave the coop. Last night, I spent my evening giving her warm baths, trying to help the swelling in her body come down, or if possible, an egg that may be stuck, pass. But, nothing. Trust me, three years ago, I would never have imagined bathing a chicken in a giant Tupperware filled with warm bath water. Oh, how things have changed. I went to bed last night, hoping for the best, again. Wanting to wake to a chicken that was spunky and begging for food at the first site of my boots approaching the gate. This morning, I awoke to seven hens begging to get out of the coop, all hungry, ready to meet the day. I unlatched the door, peeked in, crossing my fingers. Zorro sat, still in pain, unable to move but a couple of short chicken steps. What to do with a sick chicken? I had exhausted every home remedy from the online chicken blogs. A sweet friend, knowing my great concern, messaged the number to a local bird vet, specializing in farm animal care. An appointment was made. The vet happened to be smack in the middle of downtown St. Petersburg, next to fancy restaurants and designer boutiques. I chuckled at the location and the fact that I was about to carry a farm chicken through such an atmosphere. With just a few looks, we made it to the vet. The prognosis wasn’t good. Zorro was passing, painfully, due to an “old-age” disease. Tears swelled up. I held them back. This was a chicken, I told myself. I knew this was the reality of keeping chickens. But, my heart broke for Zorro. She was a chicken, but one that had nourished our bodies with countless eggs. A chicken that delighted my children as they watched her daily run and scratch in our yard. I know, a “good farmer” shouldn’t be sentimental, but I was. It was agreed that Zorro needed to be put down. I stroked Zorro’s neck, her eyes closed, she was at peace. I left the vet this morning, with an empty box, and a reality I knew I’d have to one day face. A reality every owner of farm animals must face. The reality of life and death. In honor of Zorro, I’m sharing an egg recipe today. One our family regularly enjoys when we are blessed with a surplus of eggs. 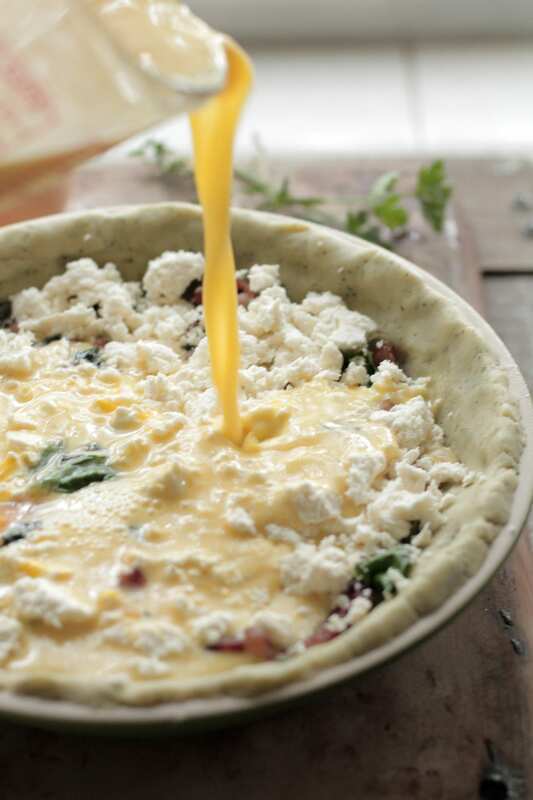 Made with cream (or whole milk), eggs, chard, feta, and pastured bacon. A simple meal that provides comfort and nourishment. A meal to celebrate and respect the life of an animal that helped nourish our lives. 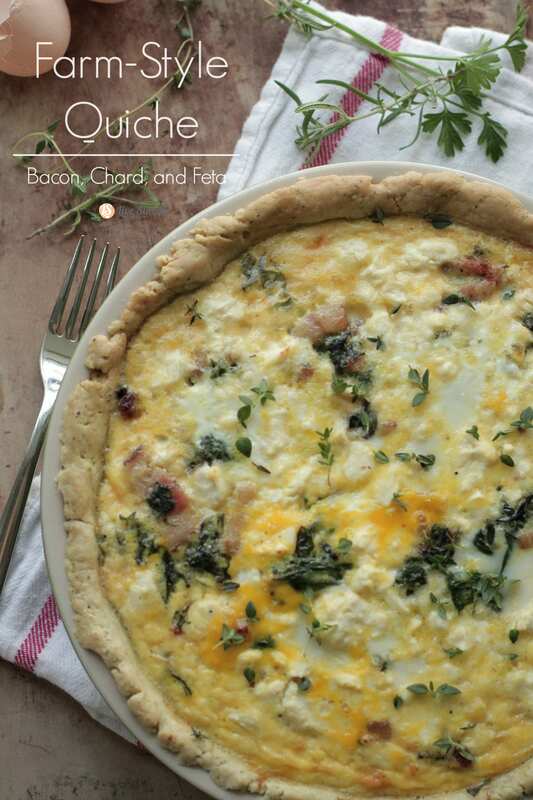 Made with cream (or whole milk), eggs, chard, feta, and pastured bacon. A simple meal that provides comfort and nourishment. 1 1/2 cups unbleached all-purpose flour I use white flour to make a pie crust. You're welcome to experiment with whole white wheat or spelt. In a food processor, add the finely chopped herbs, flour, and salt. Pulse to combine. Add the cold cubed butter to the food processor, pulse for a minute. The mixture will resemble coarse crumbs. After a minute, gradually add the water, one tablespoon at a time, pulsing the mixture in the food processor. The mixture will begin to stick together and form a ball of dough. Note: You may need to add one more tablespoon of water depending on flour. Turn off the food processor, form the dough into a ball. Press the dough into a 9-inch pie dish. Work the dough with your fingers, so the crust lines the entire dish. Place the pie pan (lined with dough) in the freezer while the filling is prepared. For the filling: melt 2 tablespoons of butter in a skillet. Add the chopped shallots and bacon. Cook until the shallots are translucent and bacon slightly cooked. Add in the swiss chard and a pinch of salt. 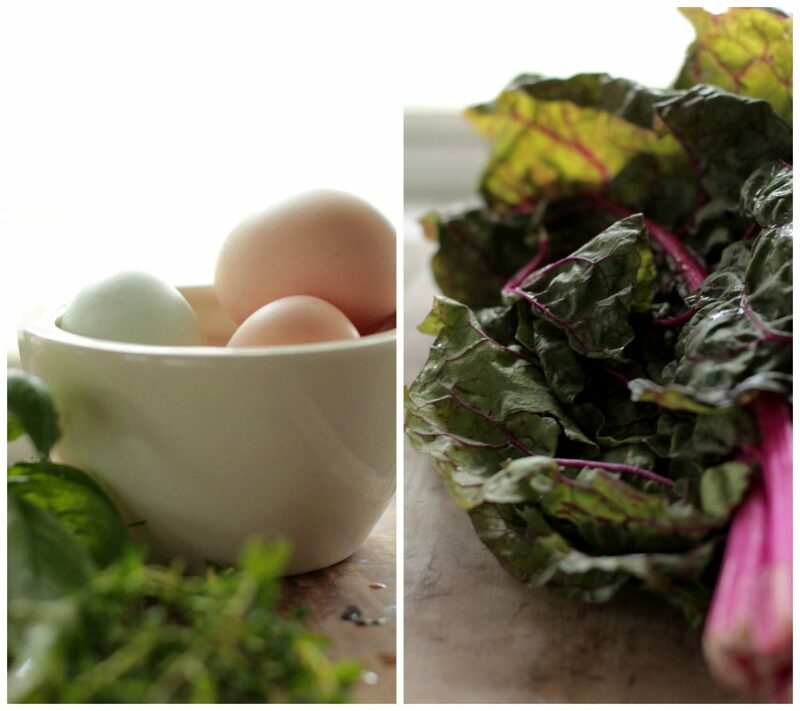 Cook until the chard wilts (4 minutes). Remove the pie pan from the freezer. Pour the chard mixture over the cold pie crust. Crumble the feta cheese over top. In a small bowl, whisk together the cream, eggs, and salt and pepper, to taste. Pour the egg mixture over the cheese and chard. Bake for 40-50 minutes, until the center is firm and “springs” when touched. That was the saddest story!! I really thought when you got up in the morning she’d be fine. Well, it sounds like she had a happy lil chicken life. RIP Zorro. See, this is why I can’t have animals.. I get way too sentimental! So sorry to hear about Zorro! It’s never easy losing a sweet pet. What a wonderful life he had with you all. Blessings to you! 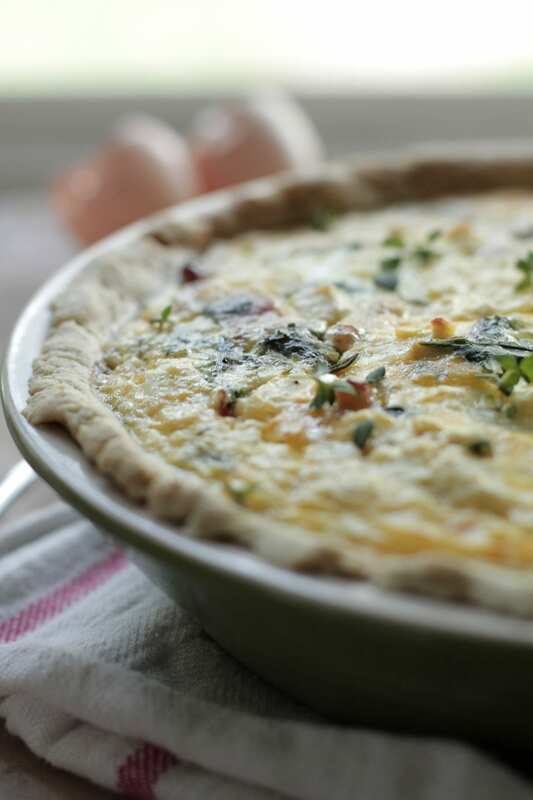 As an avid blog reader, I have to be totally honest: The story about your sick chicken mixed in with your quiche pictures was very unappetizing. So sorry to put it that way. If I wasn’t looking for an amazing recipe exactly like this today, I would have skipped it. But that’s what blogging is all about, right? Getting constructive feedback? I did make the quiche and it was very delicious. Jen, Thanks for the feedback. Glad you liked the quiche. Really? I didn’t find the story unappetizing at all, in my mind chicken= food. Not to be insensitive; but I was a little surprised the chicken was put down instead of eaten, I haven’t raised chickens myself so I didn’t know how one would feel about them. I liked how the story revealed the relationship between farmer and livestock and how it relates to the welfare of each. It sounds almost sacred and I’m sad I may never have the chance to experience that. 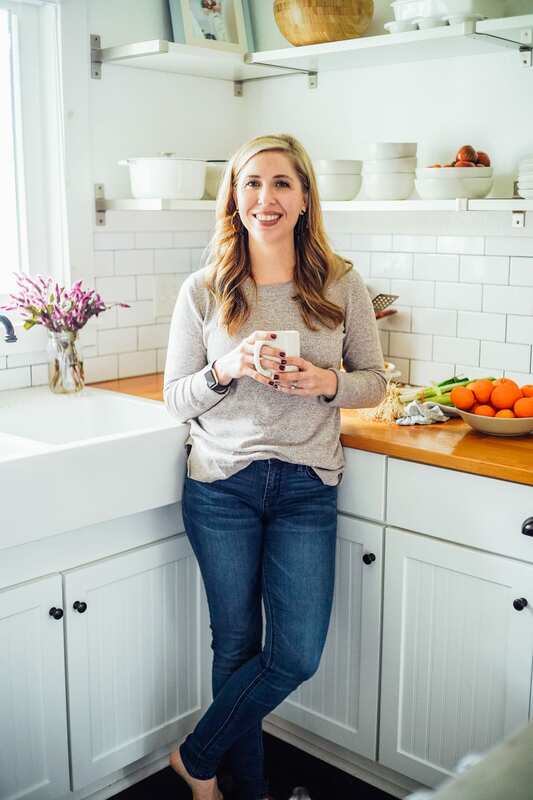 Great post, Kristin, thank you for sharing your touching story. Hey Bethany, Thank you. Since he was ill we couldn’t take a chance, so we had to put him down. Egg-laying hens aren’t very good for eating, so most of the time (if they are killed due to old age) they can be used as stock chickens (broth/stock making). I love this dish. Making it again tonight! The life story of a chicken that gave you eggs and pleasure and you gave food and a safe home. That’s what life is all about. You can’t separate the eggs from the chickens. Stay with your “blog style”, it’s real. Hey Marthea, Thank you so much :). Thank you so much, My Nana :). Enjoy the quiche!!! 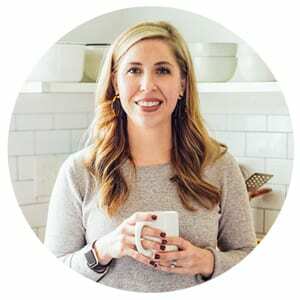 Loved your story and can’t wait to try the recipe! Jen, I’m just happy it wasn’t a chicken recipe by the time I got to the end, haha. Seriously, I’m sorry you lost Zorro and think it’s wonderful to honor her by giving us a delicious recipe. Cheers! Lol, me too! 😉 Enjoy the quiche, Stacy!! 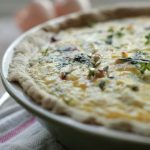 This is my go to quiche every time! Thanks so much!! Good morning! 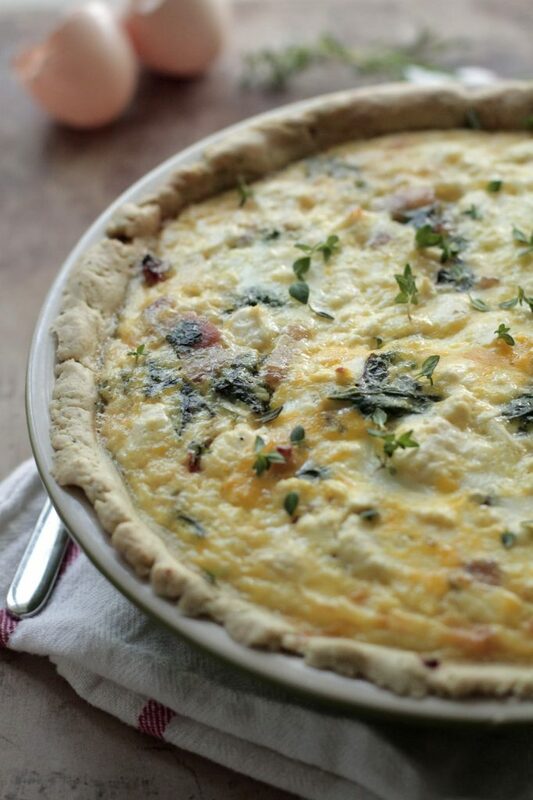 Just made this quiche for our holiday dinner last night and it was a huge success. I modified only slightly to adjust for family preferences (a little more bacon and less cheese). Hubby thought it was the best thing at the table as it was perfect! Thank you so much for a a great recipe! I”m looking for another opportunity to make it. That’s so great to hear, Karen! I’m so glad it was such a hit!